DANDONG -- An inter-Korean forum scheduled to be held in the city of Dandong, in China's northeastern province Liaoning, on Thursday was canceled due to objection from Chinese police apparently wary of international sanctions on North Korea. 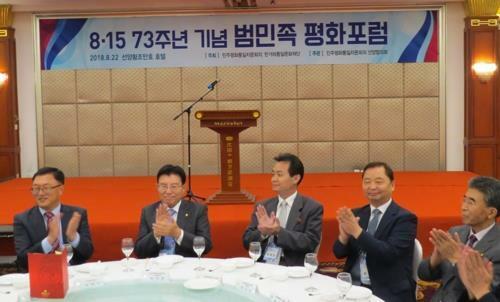 About 40 people, among them South and North Koreans and overseas Koreans, gathered in Dandong in the morning to attend the "Pan-Korean Peace Forum" to be hosted by the National Unification Advisory Council, a South Korean constitutional organization that advises the president on unification policy. But they were unable to hold the forum in the face of opposition from China's police. They came to Dandong, which borders the North's Sinuiju, from Shenyang by a chartered bus. The forum's opening ceremony and welcome dinner were held in Shenyang on Wednesday. At the Dandong event, participants had planned to give presentations and hold debates under three broad topics: inter-Korean trust building and peace, balanced development of the national economy and the roles of South and North Korea and overseas residents in peace and unification. Reasons for Chinese police's objection are not clear but watchers speculate that they may have felt wary of a public event featuring figures from the two Koreas taking place in the North Korea-China border area amid ongoing international sanctions on Pyongyang. "Organizers submitted forum presentation documents and the list of participants to the Chinese authorities about a week ago and took other due procedures. But we were suddenly notified of the cancellation of the event last night," said an official involved in the forum. The South Korean Consulate General in Shenyang, which had prior contact with the government of Liaoning Province on the Dandong forum, said it was looking into the cause of the cancellation.